Please contact our office for purchasing options. The ultra-compact 1-cup coffee machine is designed not only to make the perfect espresso, but also to be as small as possible. 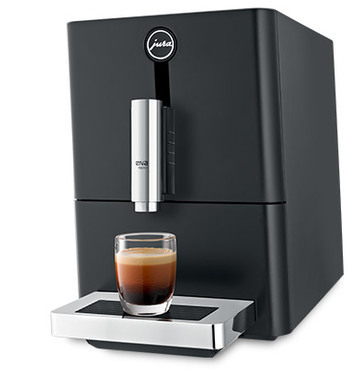 It can be programmed with three user-defined cup sizes, each in two aroma levels. The aroma preservation cover keeps the coffee beans fresh, the Aroma+ grinder gently grinds them, and the Micro brewing unit extracts the coffee under the ideal conditions. The intelligent preheating feature ensures that the coffee, crowned by a feather-light crema, is always dispensed piping hot. Aroma+ grinder and Micro brewing unit for the ultimate espresso. Touch panel with three user-defined cup sizes and two aroma levels to choose from. The ultra-compact model, reduced to the absolute minimum. 23 x 32.3 x 44.5 cm (W x H x D). The automatic energy-saving mode, programmed switch-off time and patented Zero-Energy Switch ensure high energy efficiency. #101A, 5760 - 9th Street S.E.